I am really thrilled to be one of the selected artists in the book Contemporary Painters by Danijela Kracun and Charles McFadden, published by Schiffer. This beautiful book showcases 100 painters from around the world, selected by the authors and working in a huge variety of styles. My pages are visible to the right and the book can be bought on Amazon. I'm also pleased to be part of ABNA's brand new book showcasing its members, which gives a beautiful overview of current naïve art from British artists living in the UK and abroad. You can see my two pages above. Please contact me if you would like to buy a book, or visit the ABNA website. I am currently exhibiting four pieces at the ABNA 2011 summer exhibition at the Crypt Gallery in St Ives, including my recent large-scale commission piece for Scholastic, Once Upon a Story, which they have kindly loaned back for this show. If you are in the area then do go and visit the show; it is packed with beautiful naïve art, and always a cheering experience! I spent a day at the Spring Fair at the NEC in Birmingham - a great place to meet fellow creatives and potential working partners. If you are an artist or illustrator, or you work in the art trade at all, it's definitely worth a visit to investigate new opportunities. At last! I have finished the biggest piece of my life to date: Once Upon a Story. Painted as a special commission for the children's publisher Scholastic UK, it's a celebration of reading and books, filled with nursery rhyme characters. Measuring 48 x 36", it's physically the biggest piece I've done to date as well as the most complex. This piece will now adorn the refurbished Scholastic office in Witney. I showed four pieces at the Association of British Naïve Artists (ABNA) Winter Show, which took place from 16th to 19th November at the Crypt Gallery in St Ives. Otherwise I've had a quiet 2010 with regard to exhibitions in order to focus on my forthcoming big commission piece, but am hoping to show a bit more widely in 2011/2012. I have found the perfect new home for one of my favourite pieces, Carnival Day - a place where it can truly fulfil the objective I painted it for: to make people happy! It has been donated to the children's section of the charity Paintings in Hospitals, which puts works of art into hospital wards to promote recovery and lift the mood of patients. I'm hoping that lots of children will be able to benefit from the painting and that it can help to make their hospital stay a more cheerful experience. The Dot Foundry, the printing house which produces my fine art prints, won the Fine Art Trade Guild Print Quality Award at the Art and Framing Industry Awards 2010. Celebrating the best achievements in the printing and framing world over the past year, this prestigious award is well deserved – all of my prints look lovely! I am delighted to have been selected for inclusion in the latest edition of Who's Who in Art (34th Edition) - the definitive guide to noteworthy artists and individuals in the fine art world. I now have my own Facebook group! 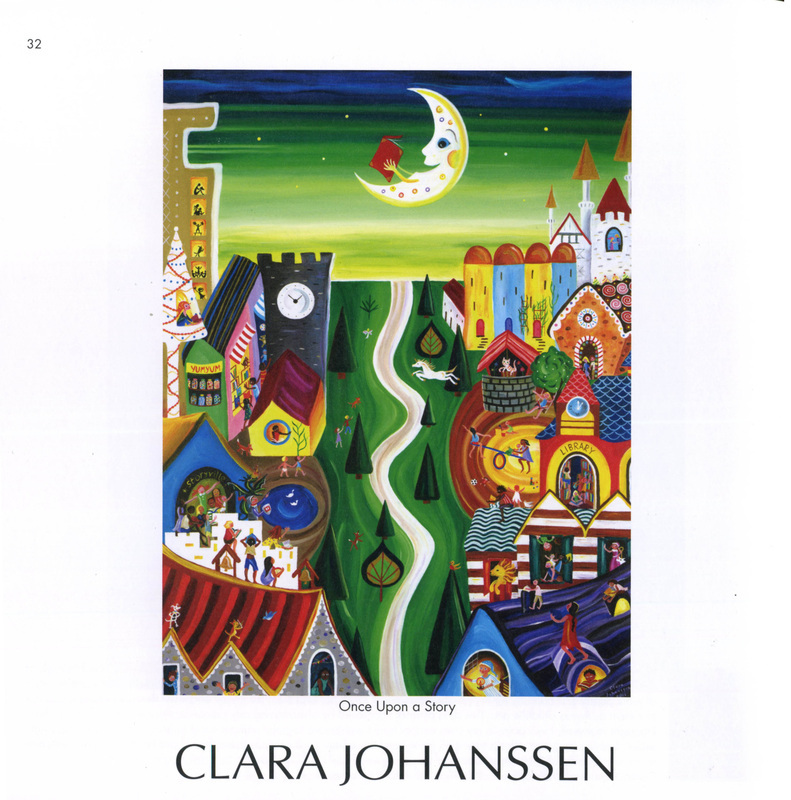 Look for Clara Johanssen Art to join and become a fan! "Your work is so honest and real which is so rare these days - it was super to discover it." "They make me happy and I can't wait to see them on my wall!" "I love having your elephant on my wall..."
"The work looks absolutely great all hung up in a gallery space..."
"A beautiful virtual faerie-tale trip..."
"Great exhibition. Loved your work – so full of life and vitality..."
"It's really uplifting and inspiring to see your work..."
"I must say they look lovely on my wall"
"I really love your work with so much movement and colour and fun! Can't wait to see what you come out with next!"